Texas is a big and beautiful state and it's important we protect and conserve its natural resources for future generations. Across the state, Texans are finding fun, creative ways to do their part, and they're garnering impressive results. The following are excerpts of the most innovative, successful ideas submitted. 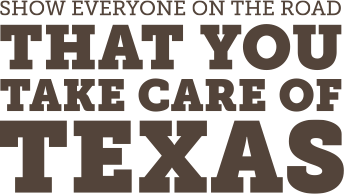 We invite you to share your story on the ways you Take Care of Texas. Bragging is encouraged and now you can show us by uploading a pictures. Water-using appliances such as dish and clothes washers are typically rated for water as well as energy usage. We always recommend when purchasing an Energy Star certified washer that can dramatically reduce a household's water use. It takes 2 minutes for the hot water to reach the faucet in my bathroom. Instead of wasting the water, I place a watering can under the faucet and collect 2 gallons of water. I use it to water my plants. In the summer we use a lot of towels at the pool. I just hang them to dry and reuse rather than washing after each use. We try to find creative ways to recycle our water and cola bottles. We've made bird feeders, plant stands, art projects for the kids and planters for new plants.